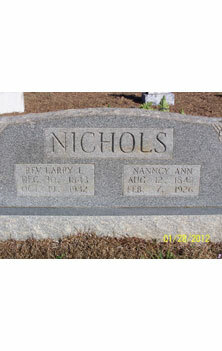 Larry was the son of Nancy and John L. Nichols and was born December 30, 1843 at Bexar, Marion Co., AL. He married Nancy Ann Wiginton January 4, 1866 in Wayne Co., TN and died October 19, 1932 in Hamilton, Marion Co., AL. Nancy was born August 12, 1843. Pension papers state they had the following children: Sintha Evaline, born December 6, 1866; William Lafayett, born October 1869; John Thomas, born December 6, 1871; Richard Franklin, born July 14, 1873; Sena, born October 15, 1875; Julia Ann, born December 29, 1877; Nancy Ann, born March 6, 1880; Marion Alonzo, born December 23, 1882; Mary Jane, born January 27, 1885; Lorenzo Dow, born July 27, 1887 and Sarah. Picture submitted by oyce Rye Kasberg.